After the over eating of Yule, it was time to over booze at New Year. As is tradition. The Beard and I hopped over to the Isle of Wight to visit his brother and sister-in-law. They live in Ventnor, a lovely little town right down the bottom of the island. And when I say live, I mean whizz around running The Crab and Lobster Tap. Yes folks, I spent New Year in a pub. With the owners. That are family. Thank the maker for fresh air, bacon sarnies and ibuprofen. Or I might be dead. in the 1930's - but I am not too sure how true that is. Lovely bathroom glass including a handy soap holder and a little trinket type pot, that now hold my hair grips. And the tall lamp at the back is a tea light holder. Winner! Not the same glass, granted, but only £2 for the set. And they sure do look purty! Now. In the pic this looks a bit naff. But it is Laura Ashley and it was only £1.75. And it does look lovely on. Well - I think it does. Once the rest of our friends had arrived, it was time to get ready. I had planned a very sophisticated outfit back in November of pencil skirt and black long sleeved blouse with roses and shoulder pads a go-go. I was thinking secretary meets Dynasty. But then I gained weight and didn't like the way it looked the week before we were due to go. Damn my Toffifee munching!! A quick peruse around Primark ensured that I looked suitably Eighties, and all for £15, including boots. I am loathe to buy things that I cannot use to make myself look 40's in some way or other, and I am pleased to say that although the boots are pixie-esque, with the right dress I think they will just about make the cross over. The top is universal, but the skirt went in the charity bag as soon as I got home. It was made of something hideous called "shell material". I am surprised I didn't shove a fag burn in it within 2 seconds. No.. I had not touched a plug with wet hands. This is the product of curled hair and back combing. And the tights were fishnet - not 15 denier as they look. Perish the thought. I am cheery here. I would not be when I had to recover my hair from all that back combing. Lots of conditioner later and I was left with hair that would not hold a curl for a week. Camper than a row of tents. Freddie and George made a special guest appearance. As did a certain Beard masquerading as Steven Tyler and Tommy Lee and Brian May all in one person! Complete with bow and a LOT of lip gloss. Which made smoking treacherous. A Beard with a guitar is a happy Beard. A drunken LandGirl in the 1980's needs aviators. It was an excellent night full of acoustic classics such as Faith, Don't You Want Me, In between Days, Billie Jean, Turning Japanese, Echo Beach and That's Entertainment. And so we rang and sang in 2011. And danced. And sang some more. And drank. ALOT of cider. We got to bed at about 3am. After I had decided to have a shower. I semi remember doing this. It involved some vague plan to remove my heavy eye makeup as I could not find the baby wipes. It took a while - but I felt alot better in the morning for not waking up a sweaty mess. Ahhh.. that's better. Back in my 1940's skin. We headed down to the sea front to be greeted by police and alot of paps dotted about. And then my memory came back. We had heard o the grapevine of New Yearness that a certain Mr Robert Pattinson was on the island. Not only that, but he was partying down the road. We all kind of went "hmmmm.. yeah... uh huh" (despite secretly squealing inside. Yes. I am firmly a member of Team Edward. Please don't leave my blog) and drank on. I gave up all hope of catching a glimpse and became alot more interested in my egg and bacon sarnie. I should point out that I do not normally eat sandwiches with cutlery. The egg was particularly runny. We finished the mini break with the pub to ourselves (see... there are those perks of being related to the owners again) and another late night. I am still not fully sleep recovered. I hope all your NYE celebrations went with a bang instead of a whizz-phut and I wish you all the very bestest for 2011! Hahaha, looks like you had a great night! I made pancakes, put my mobile on silent and went to bed at 9.30pm (by choice I should add) but yours looks like much more fun! Love the wild 80s hair! Mine looks like that anyway LOL!! love your charity shop finds.....and the breakkie picture. Wow, I love the charity shop finds! I too have a bit of a love for coloured glass! I havent yet actually got much, because I don't have ANY room for it so I have always convinced myself out of it (or rather, Mr Mike has!). I have a lovely blue glass pot though that houses my hairpins! This is a good use of such a pot, I'm sure you'll agree! And it looks like you had a fab night! Amazing! The joys of knowing pub owners eh? I did a quiet night in for my new years! I had work at 7am the next day, so I settled into my pyjamas, had a feast for dinner, poured myself a couple of g&t's and watched the fireworks on tv! nom. You look so different 80s-stylee! I wouldn't have recognised you. Wow, this looks like so much fun. 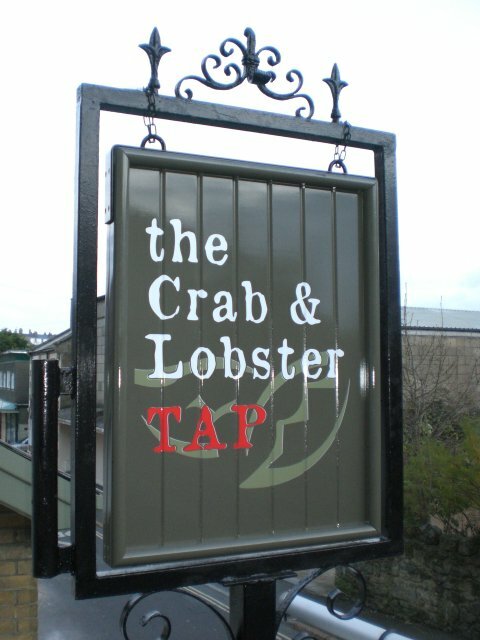 And what a great name for a pub, it makes me want to go there right now and eat crab sandwiches and drink rum. And your 80s look, bwahaha! Your friend is right about the green glass by the way, it is known as depression glass. I love how your set looks in the bathroom, I hate how boring white bathrooms are, so I am going to steal your idea and look for some green glass myself. Love all your glass - bargain! Laughed at your back combed hair; when I had longer hair that's how it looked all the time (naturally - no back combing required!) Everyone thought I'd had a perm. I just had a 70's flashback! Those are wine glasses you have the tealights in. My parents had a set that they used to use when they did safari dinners with their friends. Knowing my mother she probably still has them! Love your green depression glass finds. I still have 3 tops from the 80s - good ones from 1984, and yes they still fit. Well you certainly rocked the eighties look! i love the IOW. Is Ventor the one with the gardens by the sea? Your glass collection is lovely, it must give you pleasure every time you see it! Sounds like a fab night! I think depression glass is a specifically american thing. It was so cheap it was given away at cinemas and with breakfast cereal and the like. I have a full dressing table set in that green. Again I have no idea how old it is. My Mum bought it as uranium glass, but I'm not sure it is. I've never bothered to check it under a light! I've got a bit of a thing for coloured glass though, I always gravitate to it in charity shops but I have to restrain myself as my house is full! lol He makes a kickin' Brian May! Green glass has been popular for years. In the 1920's they made the color by adding uranium. So if you suspect it's that old, stick it under a good UV light - if it glows, it's 20's-30'.